ECCK Chairman Dimitris Psillakis (2nd from right) poses with other VIP participants at "Korea-Europe Future Automotive Forum" held in Conrad Seoul Hotel in Yoido area on March 28, 2018. 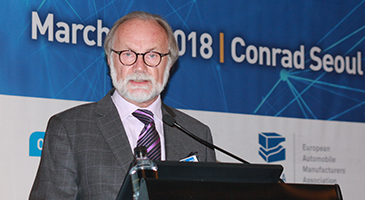 "The Korea-Europe Future Automotive Forum" was held in Conrad Seoul Hotel in Yoido area of South Korea's capital city on March 28, 2018 with well over 100 auto industry experts and CEOs focused on three main topics of future mobility; Autonomous Driving, Connectivity, and Electric Vehicle. The forum on the future automobiles held under the theme of "The Future of Mobility Will Be Cleaner and Smarter!" was hosted by he European Chamber of Commerce in Korea (ECCK), a leading chamber of commerce formed by European businesspeople. 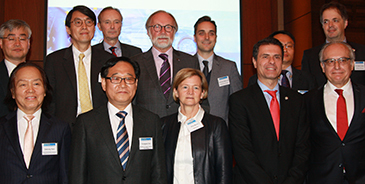 The business forum was co-hosted with the European Automobile Manufacturers Association (ACEA) and Korea Automobile Importers and Distributers Association (KAIDA). Experts and academics as well as industry executives discussed the latest trends and technologies of automobile industry and its future in the morning hours of the day. The forum offered a unique opportunity to hear from various professionals on the future of the automobile industry including the transportation revolution. In particular, future cooperation of automotive industry between South Korean and Europe was discussed amongst discussants. Prior to panel discussion ACEA Sec. Gen. Erik Jonnaert delivered a keynote speech on the topic of "Refining Mobility: From Auto Manufacturer to Mobility Provider." Also, featured speakers from Daimler AG, KAIDA, Scania as well as experts representing renowned universities and government research institutes, provided insights and fresh perspectives on the recent trends in the sector. The event opened with the welcoming remarks by ECCK Chairman Dimitris Psillakis who stressed "the long history of innovating together, the strategic partnership in automotive technologies in both South Korea and Europe in his speech. 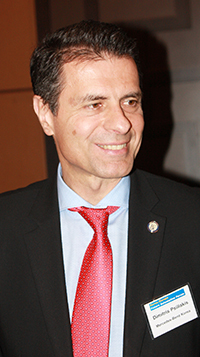 "In light of these paradigm shifts in automobility in the age of the Fourth Industrial Revolution, it is important to deepen this partnership and turn challenges into opportunities, and find solutions to environmental crisis together,”Chairman Psillakis said. EU Ambassador to South Korea Michael Reiterer delivers a welcoming speech at "Korea-Europe Future Automotive Forum" held in Conrad Seoul Hotel in Yoido area on March 28, 2018. Also, EU Ambassador to South Korea Michael Reiterer delivered a welcoming speech to emphasize the growing cooperation in the automobile industry between Europe and South Korea. This forum symbolized the efforts of ECCK to shed light on the trends of the industry and promote cooperation between Korean and European businesses. Based on the extensive information exchange throughout the event, the ECCK hopes to strengthen the level of cooperation and hopes to expand business and investment opportunities between Europe and South Korea.